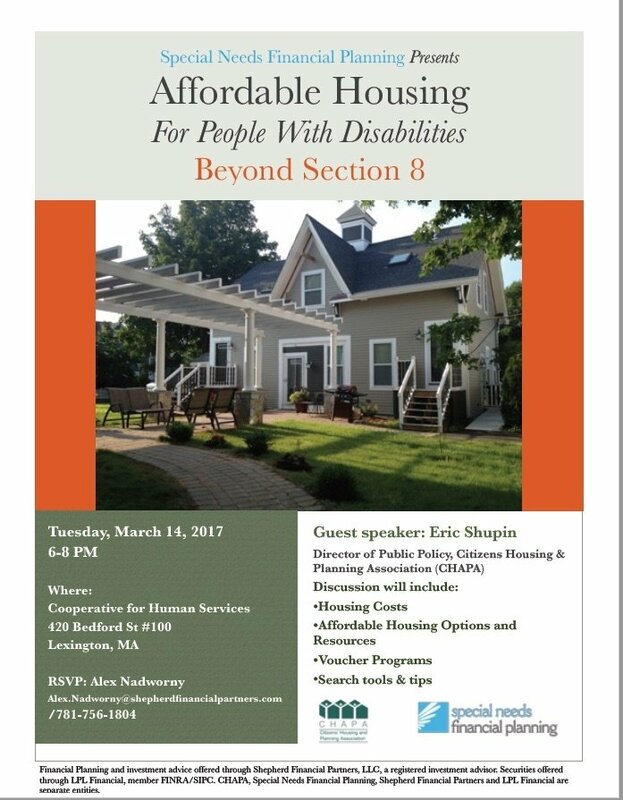 Due to the winter storm predicted for tomorrow, we are postponing our workshop, Affordable Housing for People with Disabilities Beyond Section 8, for exactly one month from today. Please join us on Thursday, April 13, same place and time; see the flyer below for details! We have a housing afforability problem in Massachusetts because we have a housing supply problem. Learn how to navigate and evaluate the options available for affordable housing: JOIN US for affordable housing research and tips from Eric Shupin, Director of Public Policy for the Citizens Housing and Planning Associaiton (CHAPA). Tuesday, September 13 - NOT Your Average Housing Panel! Join us for a panel discussion of personal experiences and expert information, as well as time for Q & A and networking! RSVP to Alex at 781-756-1804 or via email. 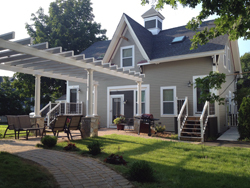 Brief history and summary of changes in residential options over the years. Discussion of creative housing options. The planning process for your family member’s lifetime needs. Proposed legislative changes on accessory apartments in Massachusetts which may create additional options for families. Cheryl Ryan Chan is the Principal Facilitator at Person-Centered Planning Partners and a parent. Person – centered planning is a toolkit of processes and systems providing individuals with disabilities or anyone planning a life change to empower themselves, identify and sustain a circle of support, and develop action plans for success as they face those transitions. Cheryl has a strong record of community organization, and advocacy as well as providing social media consultation to non-profits. She is an experienced public speaker and successful fundraiser and friend raiser for nonprofits. Leo Sarkissian has worked in the disabilities field for thirty five years and presently heads The Arc of Massachusetts, an advocacy organization which works on behalf of people with disabilities and families. The mission of The Arc is to enhance the lives of individuals with intellectual and developmental disabilities and their families through advocacy of community based services and supports. In addition to Leo’s work with The Arc on policy and advocacy he has served as a clinician and community planner including early intervention, school-based groups and other activities. He edited three editions of “Building a Future” which focused on housing alternatives and has spoken on a wide variety of topics related to supports and services. Susan Nadworny is currently working with Riverside Community Care, an organization providing more than 40,000 children adolescents and adults with a broad range of behavioral healthcare and human services. She is a parent and a past chairperson of Massachusetts Families Organizing for Change (MFOFC) and has also worked with Massachusetts Advocates Standing Strong. Susan has devoted her adult professional life to providing support, community and powerful advocacy for families and individuals with disabilities. Panelists and their associated entities are not affiliated with LPL Financial. 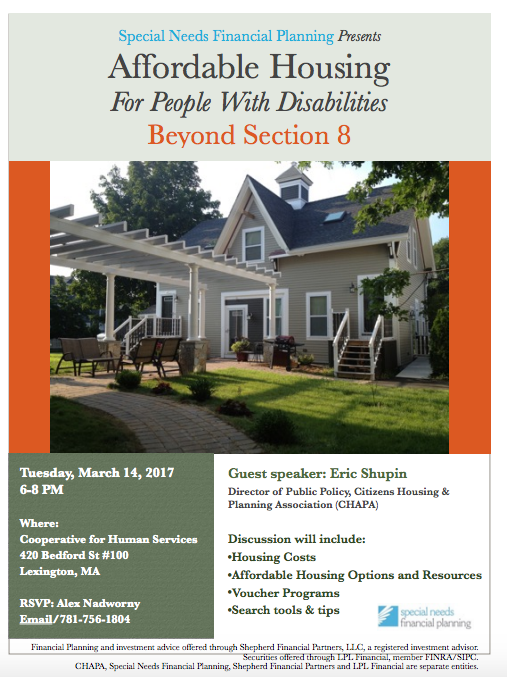 We are hosting a presentation for families planning to create a home for their loved one. 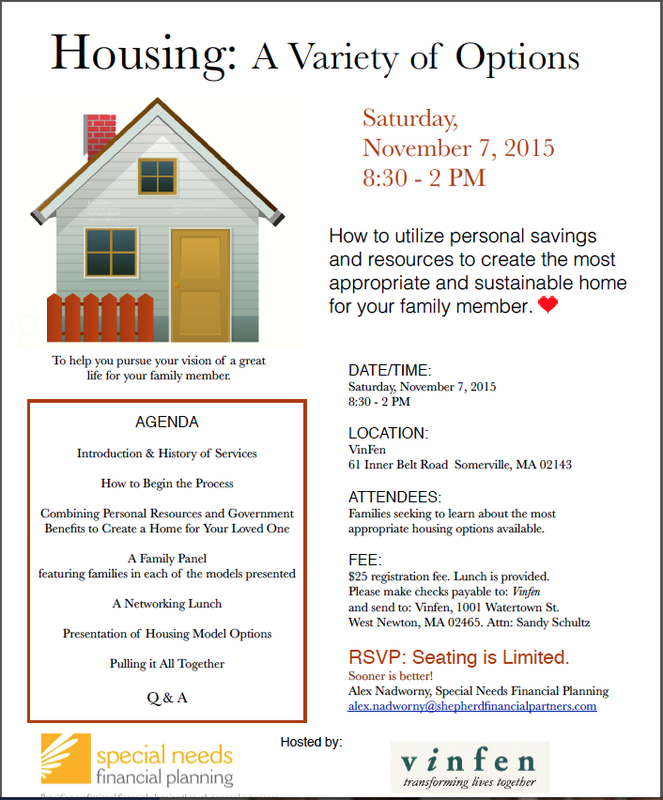 At this presentation, discussion will center upon combining personal savings and resources with government benefits to design the most appropriate and sustainable residential option for your family member. Please feel free to share this email or download a PDF of the flyer to share with individuals or families interested in learnng about these options. Please contact Alex Nadworny (781-756-1804) for more information.